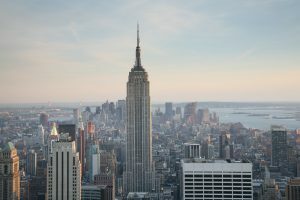 The Empire State Building stands 1,454 feet tall, including the antennae, which is 204 feet. Located on 5th Avenue, between 33rd and 34th Streets in Manhattan. The building took 1 year and 45 days to complete, which was more than 7 million man hours. The observations platforms are on the 86th Floor and 102nd floor, and it attracts more than 4 million tourists every year. On a clear day, it is possible to see 80 miles into New York, New Jersey, Connecticut, Pennsylvania and Massachusetts. On foggy nights, during the spring and autumn, the tower lights are turned off. The reason is so that migrating birds will not be confused and fly directly into the building. It is the tallest Leadership in Energy and Environment Design (LEED) certified building in the United States. Over 30 people have jumped to their death from the Empire State Building. William Lamb designed the building. The building has 24/7 security, and is monitored with CCTV cameras. There are 5 entrances in total.